Roughly 85% of the mass in the Universe isn’t made of electrons, atoms, and so forth: it’s not the stuff familiar from daily life. The name we give our ignorance is dark matter, which we suspect is made of a particle of some type. We see its effects in the motion of stars and gas in galaxies, in the way galaxies cluster together, and in the relic light from the Universe’s infancy. However, the identity of dark matter is still unknown; while we can easily say a lot about what it isn’t, we don’t know what it is. Here’s what we know (at least a partial list): dark matter is not any ordinary particle of the Standard Model of particles and interactions. It’s not atoms, it’s not neutrinos, it’s not comprised of quarks or electrons or their cousins. A better name than “dark matter” might be “invisible matter”, since light shines right through it little or no effect. That means dark matter likely doesn’t interact at all via the electromagnetic force, which governs light. It’s also probably “cold”, meaning it doesn’t move at fast speeds compared to the expansion of the Universe, and doesn’t interact very strongly either with itself or with ordinary matter. Beyond that, cosmologists are a bit stumped. We have some good ideas, though, motivated by theory, and potentially (if not easily) detectable. 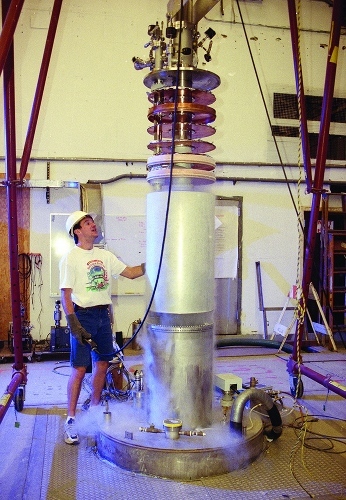 Most experiments focus on detecting weakly-interacting massive particles (or WIMPs), for a variety of reasons. However, another candidate, while less well-known, is interesting to researchers, and happens to be my favorite dark matter contestant: the axion. A Higgs-ish particle for dark matter? When axions were first proposed, dark matter wasn’t the motivation at all. Instead, they were formulated to solve a sticky problem in quantum chromodynamics (QCD), the theory that describes quarks—the particles comprising protons, neutrons, and so forth—and gluons, the particles binding the quarks together. In the original formulation of QCD, the theory predicted a strong violation of a symmetry of nature: the combination of charge (C) and parity (P). Charge symmetry happens when physical processes don’t vary on the exchange of particles with their antimatter counterparts; parity is mirror-image symmetry, relative to the spins of the particles involved. Together, the symmetry is called CP, and it is violated by the weak nuclear force in many interactions, as described by the electroweak theory. However, QCD is the theory of the strong force, and a lot of CP violation would mess up what we already know about particles like the neutron. Therefore, CP violation either needs to be less significant, or one of the quarks needs to be massless. Since we know all the quarks have mass, either something must be added to QCD to shrink down CP violation to a reasonable level, or we have to accept the unpleasant possibility that the Universe is just that way (an idea most of us really dislike). One solution to the CP problem is similar to the mechanism giving masses to particles in the electroweak theory. If that sounds familiar, it should: that’s known as the Higgs mechanism, and one consequence is the prediction of a new particle, the Higgs boson. The new particle to reduce CP violation to manageable levels without breaking QCD is called the axion. Unlike Higgs bosons, axions would have been produced in huge numbers in the Big Bang, and are stable. (The Higgs, by contrast, is so unstable we don’t see it in the detectors, only what it decays into.) Axions are electrically neutral bosons—meaning they are particles unconstrained by the Pauli exclusion principle, so they can all pile into the same quantum configuration without a problem. Axions also interact very weakly with ordinary matter, rendering them nearly undetectable in ordinary experiments — which may be part of the reason we haven’t found them yet. However, in the early Universe axions experienced a kind of friction (for reasons too complex for this post), slowing them down by a huge margin. That made them form a Bose-Einstein condensate: a collapse of vast numbers of particles into a cold fluid, in which they act collectively like a single particle. In other words, axions could be candidates for dark matter: they’re cold, they interact weakly, they’re stable, and they’re potentially numerous. The numbers are doubly important, because (unlike most other dark matter candidates) they’re very low mass, much less massive than electrons. Unlike neutrinos, which are similarly low-mass, axions don’t interact very well with atomic nuclei; as hard as neutrinos are to detect, axions are much harder. The problem is complicated by the fact that theory doesn’t predict a precise mass for axions, meaning that axions might exist, but possess too much mass for dark matter. The best hope for axion-hunting comes from one of their weirdest properties: in the presence of really intense magnetic fields, photons can turn into axions, and vice versa. For that reason, the Axion Dark Matter eXperiment (ADMX) uses a very powerful, ultracooled magnet to try to turn hypothetical dark matter axions into microwave photons. So far, the ADMX team hasn’t detected a clear signal, but . As with so many other delicate particle experiments, the key is controlling noise, which may swamp what little signal there may be. the superconducting effect could be caused by something else, which would say little about the existence or nonexistence of axions. However, the hypothesis has a major advantage: it’s relatively easy to check, since superconducting experiments of this type are far easier to perform and don’t require the expensive, large-scale detectors that have been built to find WIMPs. However, as my colleague Katie Mack pointed out, if the Josephson junction hypothesis does check out, it shows that axions aren’t numerous to be all of the dark matter we observe, so our job still isn’t finished. Since axions may or may not actually exist, and may or may not have masses corresponding to the experimental sensitivity of detectors like ADMX, it’s a bit of a battle. However, the situation isn’t really better for alternative dark matter candidates: we’re hunting for something without specific theoretical predictions to guide us, just a set of general principles that may or may not be right. If you ask me (which you didn’t, but you’re reading my post, so nyah! ), axions probably exist, since they’re the most rational solution to the CP problem in QCD. I also admit that axions are my favorite dark matter candidate particle. I have no physics reason to say that, no deep insight into the inner workings of the cosmos to tell me that. (If I thought I did, you’d be justified in sending me to the Funny Farm.) However, axions are satisfying in many ways: they solve a problem in the Standard Model that needs to be solved and could resolve the longest-standing mystery in cosmology, the dark matter problem. Time and patience will see if my intuition is correct.